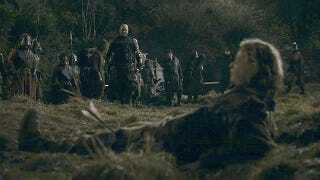 As this shot from last Sunday's Game of Thrones shows, NCIS isn't the only show to feature a reference to Skyrim's now-famous "Arrow in the Knee" joke. Well okay, it's probably the only one to feature it consciously. Thanks to commenter Kryle01 for pointing this one out. Poor little guy. To think! He could have been an adventurer like you.